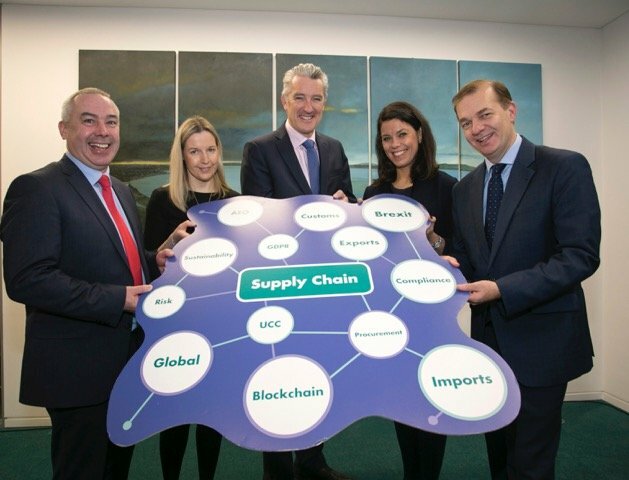 The Irish Exporters Association (IEA), in association with Rhenus Logistics Ireland, Ulster Bank, Iarnród Éireann Irish Rail and Fleet Transport held its final and fourth large seminar of eight regional events in the IEA’s 2018 Supply Chain Series. The event titled: “Securing the Interests of Irish Exporters in the Leinster Region” took place at Ulster Bank Headquarters, George’s Quay, Dublin and attracted over 70 exporters, manufacturers and service providers from all over the region. The series focuses on import and export challenges; offers solutions and practical support from logistics, trade finance experts and exporting companies; provides information around third country shipping and associated documentation as well as maximising opportunities with our air, road, sea and rail services. Attendees received an update on the Brexit-related issues on the Agri-Food sector from Jane Dempsey, Assistant Principal, Brexit Unit at the Department of Agriculture, Food and the Marine; on immigration and employment rights from Aoife Newton, Director and Head of Corporate Immigration and Employment at KPMG; and were briefed on the opportunities and challenges of trading with a non-EU third country from a Revenue perspective by Helen Brennan, Higher Executive Officer with Revenue. Other speakers included industry specialists from Bulgari, the Chartered Institute of Logistics & Transport in Ireland (CILT), Rhenus Logistics Ireland, Ulster Bank and the IEA who provided an insight into multimodal regional issues, currency trajectories and challenges facing competitiveness locally and internationally. A lively panel discussion led by Patrick Daly, IEA Supply Chain Series Chair & Managing Director of Alba Consulting Group addressed common supply chain challenges and solutions to doing business on and off the Island of Ireland relevant to the Leinster region. Breakout sessions on ‘Skills and Regulations – A focus on Brexit’ and ‘Multimodal Transport’ were well attended and provided attendees with further opportunities for engagement.